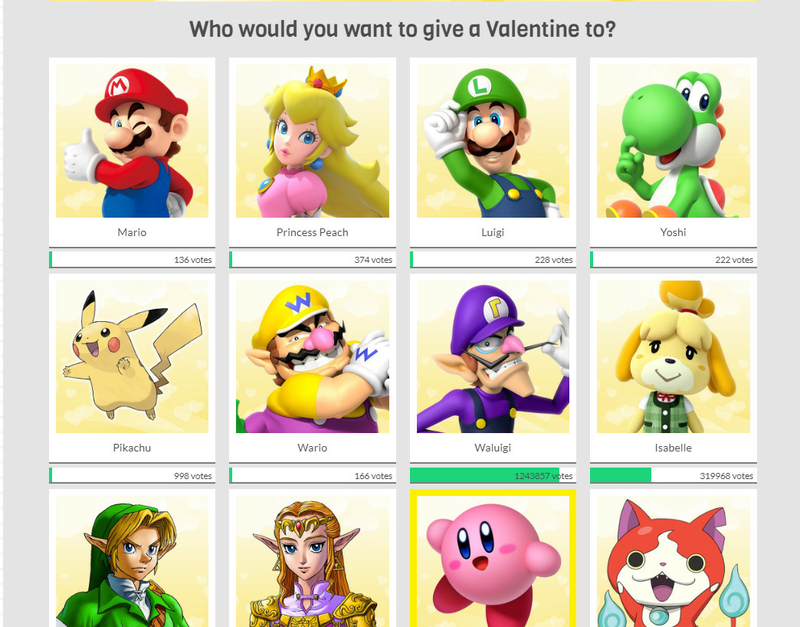 For Valentine’s Day — this Thursday, Feb. 14 — Nintendo decided to do something nice for its cast and crew, opening up a voting page where players and fans can choose to give their favorite characters a Valentine. That is charming and wholesome, and I support it fully. What I cannot abide is the results of such a campaign. Look at this. Your eyes might initially be drawn to Luigi, trying his best to draw your attention with a winning tip of his cap, or the difference in art styles between the entire roster (why not use a cuddlier, more charming Pikachu from the latest Let’s Go! adventure?). Upon processing the above, what I then focused on was the discrepancy in votes — or rather, Valentines awarded to each suitable bachelor/bachelorette. Do Nintendo’s fans truly believe that Mario and Luigi, combined, only deserve a paltry 364 votes? More importantly: Why does Waluigi have over one million votes? This isn’t a completely hopeless situation. Isabelle, the wonderful mayor’s assistant from Animal Crossing, sits in second place with a very respectable pile of over 300,000 Valentines. She deserves each and every one. Kirby, my Smash Bros. main and a very good lad, has collected over 1,000 Valentines. That’s good, and I commend each and every gift-giver who made such a conscientious choice. However, we need to rectify the Waluigi error. Please stop giving him Valentines. Waluigi is a villain and a charlatan. He wasn’t invited to the Smash Bros. crew because of his behavior, and yet the rest of Nintendo’s fans insist on rewarding him. He does not deserve them or their love, and I do not want to see the society that blooms from the result of such an act of hubris and selfishness. It’s still not too late to brighten up Valentine’s Day for a Nintendo character who’s kind and deserves it. Waluigi is a coward who belongs in the gutter. Choose accordingly.